Proper lighting is the most important item in indoor gardening. Adequate light is the key to photosynthesis. Without adequate lighting, plants grow weakly, are leggy, and may even die. Our eyes automatically adjust to varying light conditions, so what seems like bright lighting can be useless for plant growth. Natural sunlight is ideal for plant growth. For indoor gardening it is up to the gardener to supply the proper color spectrum of light in adequate quantities, to replace the natural sunlight. There are many choices for lighting, but the two most commonly used types of lighting include HID and Fluorescents. The most important thing to know about grow lights is which one to use based on your plant. Our experienced staff understands grow lights and the effects certain one's will have on your garden. Come in or call today to discuss your lighting situation with us. Fluorescent Lighting: Since fluorescent grow lights produce just a fraction of the power of Metal Halide and High Pressure Sodium grow lights, they are generally unsatisfactory for general use. They are useful for starting new plants and for some compact hydroponics projects, but must be placed very close to the plants. To cover a 2′ by 4′ area, you will need a minimum of four 54-watt 4′ fluorescent bulbs placed as close to the growing plants as possible. Even then, results may not be satisfactory and producing fruits and vegetables will be difficult. Still, fluorescent grow lights are well suited for the very early stages of plant growth, and are often used to start new plants. High Intensity Discharge: Both Metal Halide (MH) and High Pressure Sodium (HPS) bulbs fall into this category. 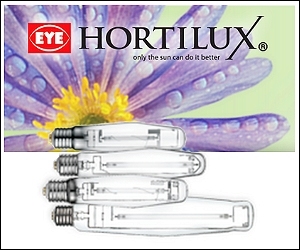 Their intensely bright light makes them ideal for lighting indoor gardens. Both require Reflector housings and Ballasts to operate. 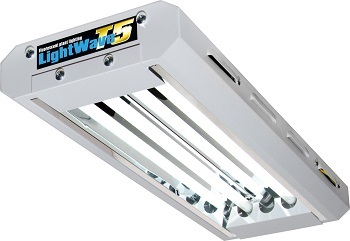 In almost all cases, the same reflectors and switchable ballasts can be used for both MN and HPS bulbs. The area that these forms of lighting can cover depends on their wattage. Ranging from 150 watts to 1000 watts, a single fixture can cover from a small self-contained hydroponics garden up to 20-40 sq. ft. Large installations will require multiple fixtures. Since HID lamps create a great deal of heat, proper venting or even ducting and fans are usually needed. Metal Halide These bulbs produce an intense light of blue-white spectrum, excellent for vegetative plant growth. A plant grown under a metal halide light will often exhibit increased leaf growth and strong stem and branch development. They are less suited for the flowering and fruiting stages of most plants. High Pressure Sodium: These lamps produce an orange light, which simulates the autumn sun. HPS light is best for fruiting and flowering. Fruit and flowers will be larger and more prolific when these lights are used. Flowers and vegetables finished off under high-pressure sodium will show tighter, stouter blossoms with increased yields. High-pressure sodium lights are often used in commercial greenhouses. If there is to be only one light source for the entire life of a flowering plant, HPS is the best economical choice. Many indoor and hydroponics gardeners switch between MH and HPS bulbs, depending on the growth cycle. Almost all lighting systems we carry support both types of HID bulbs. 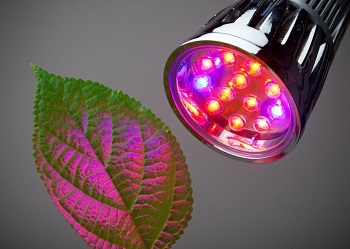 LED Lighting: Grow lights using efficient LED sources are relatively new. 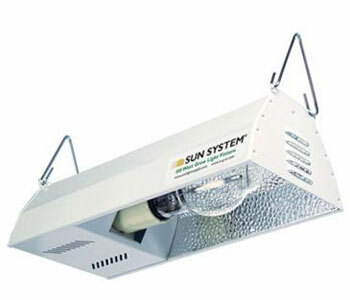 Early versions of these lights had insufficient power to be effective for most growers. Recently a new high-density LED array technology was introduced that packs more LEDs and offers more power than previous LED Grow Lights.